The Title "Seeds of Light Healing Meditations for Body and Soul Reprint Edition" is written by Elizabeth K. Stratton. This book was published in the year 1998. The ISBN number 0684838761|9780684838762 is assigned to the Paperback version of this title. The book displayed here is a Reprint Edition edition. This book has total of pp. 256 (Pages). The publisher of this title is Simon & Schuster. We have about 37690 other great books from this publisher. 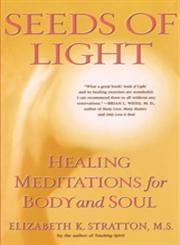 Seeds of Light Healing Meditations for Body and Soul Reprint Edition is currently Available with us.